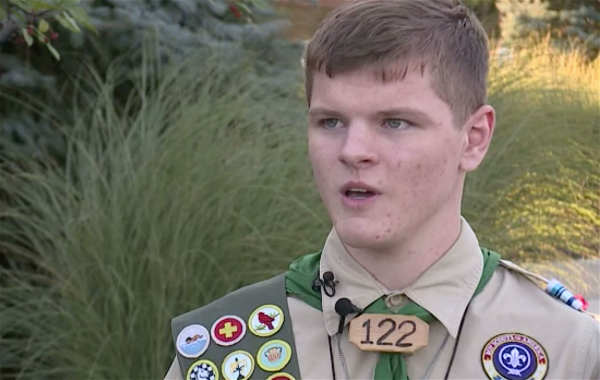 Brian Hare, a high school student and an Eagle Scout with dozens of merit badges, was recently dubbed a hero for saving the life of one of his Scout leaders. 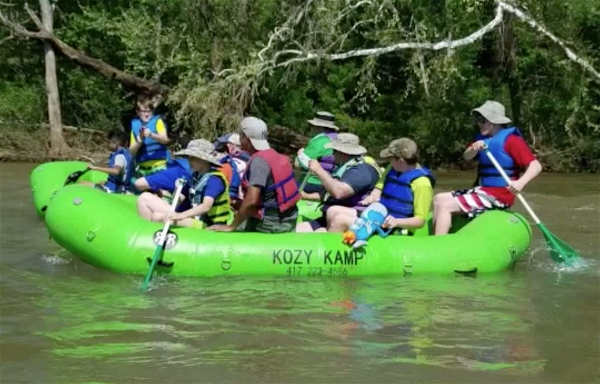 The 16-year-old from Olathe Northwest High School in Kansas was on an annual trip to the Elk River in Noel, Missouri, in May, according to the Boy Scouts of America (BSA). On the trip, the group was told the water level was especially high due to recent rains, and instead of their usual canoes, they needed to use rafts. Hare, two leaders, and three younger scouts were in a raft on the river when they struck a fallen tree. Hare and his leader Srinivas Kotipalli were thrown into the water. Hare was able to grab back onto the raft, and the group quickly made their way to the shore. Then they looked around for Kotipalli and saw him clinging to a tree branch in the middle of the rushing water. “I heard Mr. Kotipalli screaming, ‘Help me I’m drowning, I can’t swim,'” Hare said. Although everyone was wearing life jackets, the fast moving water threatened to sweep their leader away. Fortunately, Hare was the recipient of a Lifesaving Merit Badge, and he knew exactly what he needed to do. He climbed onto the downed tree and held out a tree branch to Kotipalli, who was weak from the cold. But it was too short. “The only thing I could actually find at that point was a piece of barbed wire fence,” the boy said. Again and again, he tried to throw the wire to his Scout leader, but the man could not grab it. Suddenly Kotipalli lost hold of the tree branch and was swiftly carried away with the current. Immediately, the Eagle Scout jumped in the water. A strong swimmer, Hare made his way towards Kotipalli over the next 100 feet and grabbed onto him, pulling him towards the edge of the river. They eventually safely reunited with the rest of the group. 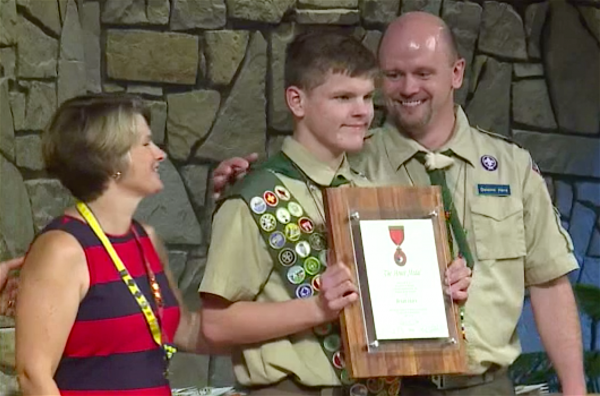 On Sept. 10, Hare was awarded the rare Honor Medal from BSA in Overland Park, Kansas. “I just wanted to see him back here alive, that’s all it really meant to me,” said Hare. Despite the boy’s modesty, others say Hare was an inspiration to everyone who was on scene during the incident. “Brian was a hero that day, you know Brian really stepped up to the plate, he did all of the right things,” said witness Mark McGuire. Fox contributed to this report.